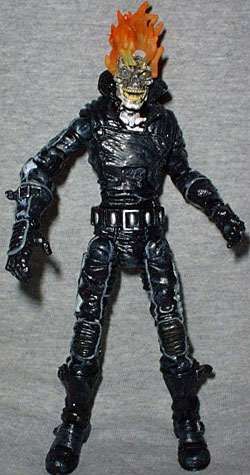 When we first got a Marvel Legends Ghost Rider in Series 3, it was the modern Danny Ketch version, despite what the info on the back of the card stated. Now, four series later, we're getting the old-school '70s incarnation of the character, Johnny Blaze. John Blaze was orphaned when his father died performing a dangerous motorcycle stunt. Adopted by Crash Simpson, the youngster swiftly mastered the tricks of the trade. When he learned Simpson was dying of a rare blood disease, Blaze started tampering with dark forces far beyond the bounds of human comprehension. Blaze recreated an ancient ritual and bartered his immortal soul for a miracle cure. Having deceived Blaze into forfeiting his soul, the Devil materialized to claim his due. Unable to take possession of his intended bounty, Satan grafted the living flame that was the soul of the demon Zarathos to Blaze's body. Thereafter, the melding of spirits would manifest itself every nightfall in the form of Ghost Rider, who used his demonic powers to create a mystical motorcycle of pure hellfire. After a few months, his automatic nightly transformations ended. He then became Ghost Rider whenever he mystically sensed evil in the vicinity, avenging innocent lives tarnished by the touch of evil. 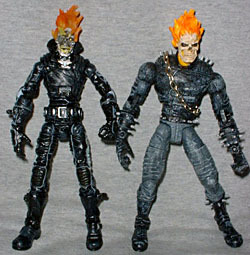 When Marvel Legends 7 was unveiled at Toy Fair, a lot of folks were surprised to see another Ghost Rider - after all, at that point, ML3 wasn't that far in the past and Ghosty was still plentiful. We couldn't tell from the images we saw then, but the new GR was 100% new sculpt with a brand-new design. The '90s GR was bigger and bulkier than his predecessor, and sculptor Dave Cortez remembered that: this figure is a scrawny little guy by comparison. He stands 6" tall (6⅝" to the tip of his flame) and has 37 points of articulation (all the usual Marvel Legends stuff - hinged toes, hinged/rocker ankles, swivel boots, double-hinged knees, swivel thighs, swivel/hinge hips, hinged fingers and wrists, swivel gloves, double-hinged elbows, swivel biceps, swivel/hinge shoulders, swivel waist, hinged torso, swivel/hinged head and hinged jaw), but put him next to one of the more muscular heroes and the difference is readily apparent. The sculpt is nicely detailed. Johnny's leathers are loose and wrinkly, just as they should be. There are tons of details in his costume, like tiny little buckles on his boots, piping on the seams and padding on his elbows, knees and gloves. Wherever you look on this guy, there's some new detail to see. The upper part of his jacket is molded from soft PVC, so that crazy collar doesn't impede his movement in the slightest. The head is very nice, as well. Despite the fact that he's just got a flaming skull for a noggin, this Ghost Rider still manages to be distinct from the ML3 version. That's helped by the fact that his flames are semi-translucent orange, rather than solid painted pieces. He's got an articulated jaw, so you can have him recite your favorite movie lines along with the actors if you like. In a really cool move, ToyBiz set up this little feature where if you open Ghosty's jaw, his yellow eyes rotate into his sockets, making him look all the more frightening. 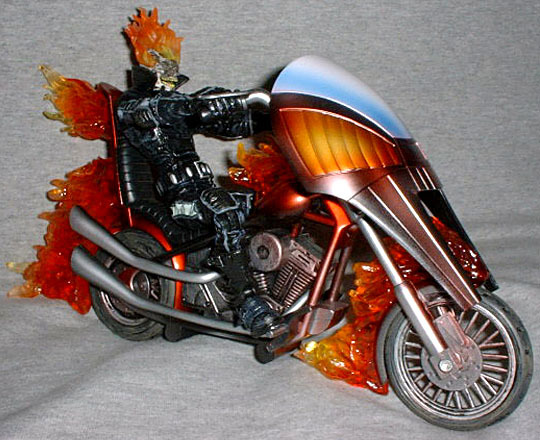 Instead of a typical base, Classic Ghost Rider comes with his flaming motorcycle. Just like the figure, the bike, too, is skinnier than you might expect, but that just makes sense: remember, he's a product of the '70s, when every little kid wanted to grow up to become Evel Knievel, so instead of a mighty muscle machine, GR straddles a stunt bike. It's 7½" long, larger than the previous GR's cycle, so the figure looks better on it: while Danny had to hunch over to ride his bike, Johnny gets to lean back and cruise. The detail is very well done. The piece is close enough to a real motorcycle to satisfy fans, and the flaming bits are cast from fully translucent plastic, so they look really great. This really looks like a motorcycle that's on fire - perfect for your Plan B firefighters! The wheels are real rolling rubber, and there's a moveable kickstand. The windscreen can be removed and snapped on the figure's arm like a giant shield. You know, to recreate all the times he never did that in the comics. There's a variant Ghost Rider available, as well: more in keeping with the way he was colored in the comics, the figure is bright blue while his ride is bright orange. 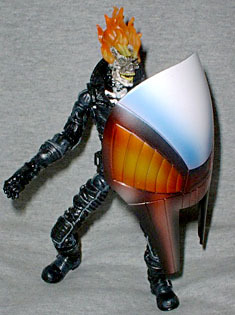 Additionally, ToyBiz gave him a new "transforming" head sculpt, which still had a bit of Johnny Blaze's face amid the flames. Three guesses why the regular version didn't feature that. Unfortunately, early casepacks of ML7 didn't have any of the variants, so finding him may be a bit tougher than usual.